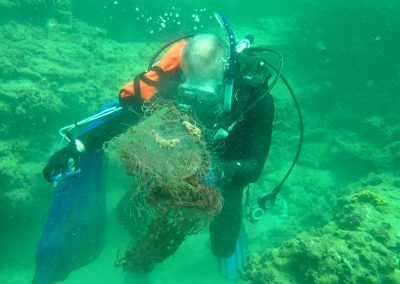 Marine debris is a widespread problem for southeast Florida’s coral reefs and is becoming increasingly more common. Such debris includes discarded fishing and boating material (e.g. fishing line, nets and anchors), trash (bottles and plastic bags), and hurricane-related debris. Debris can enter the ocean either from activities on land or on the water and can cause numerous problems to marine life including entanglement, ingestion, and tissue abrasion. These issues can result in serious injury or death to sponges, corals, fish, crustaceans, echinoderms, and other reef associated creatures. Reefs within southeast Florida lie adjacent to four of the most densely populated counties of Florida. Recreational use by local divers, fishers, and boaters in these counties has tripled over the past 40 years causing an increasing amount of pressure. 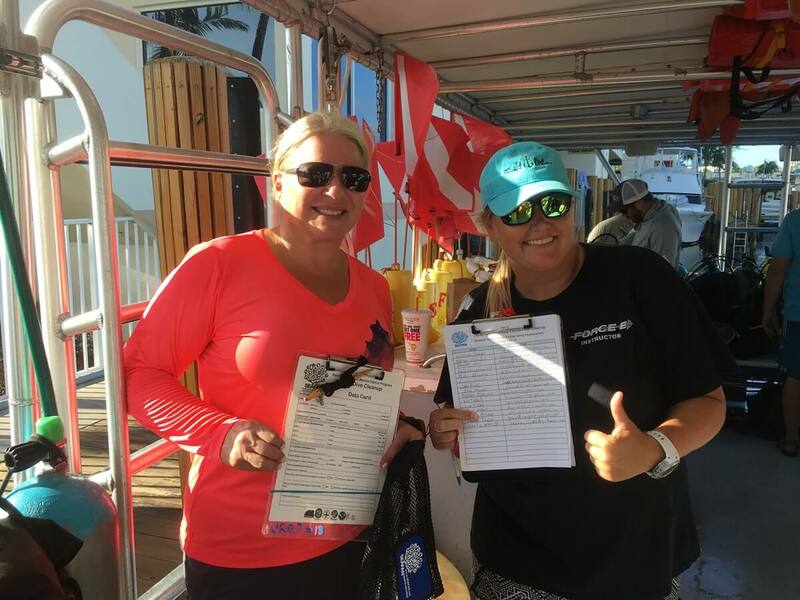 SEFCRI members, Jane Fawcett and Nikole Ordway, with reef datasheets. To effectively address the issue of marine debris in southeast Florida, the Marine Debris Reporting and Removal Program was originally created in 2008 as a partnership between the Florida Department of Environmental Protection (DEP), Florida Fish and Wildlife Conservation Commission (FWC), and Palm Beach County Reef Rescue (PBCRR). Originally part of the Fishing, Diving and Other Uses Focus Area, this program encourages local divers and dive shops to report marine debris through SEAFAN, then reef cleanup events are organized to remove the debris. 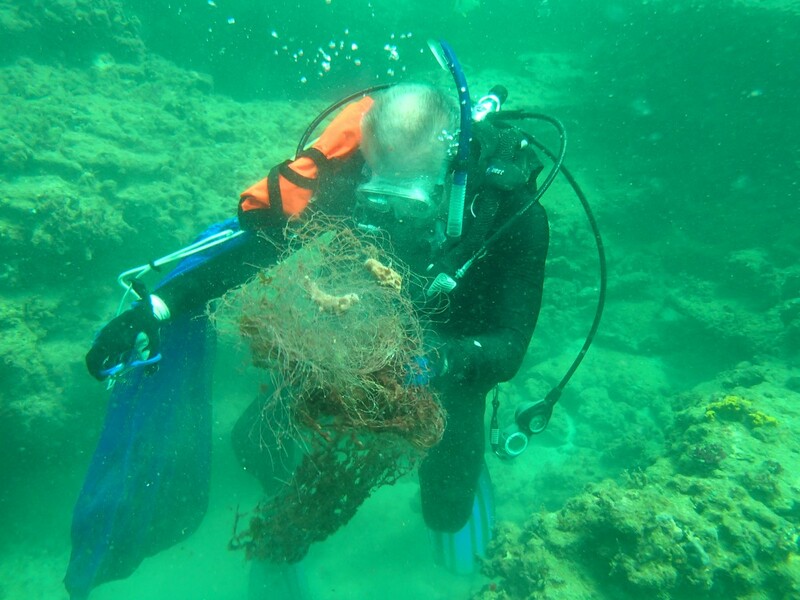 In coordination with DEP’s Coral Reef Conservation Program, the SEFCRI Marine Debris Project Team continues to help plan and organize these summer cleanups in Miami-Dade, Broward, and Palm Beach counties. To volunteer for shore-based beach cleanups or participate in underwater reef cleanups in the southeast Florida region, please see the schedule here. 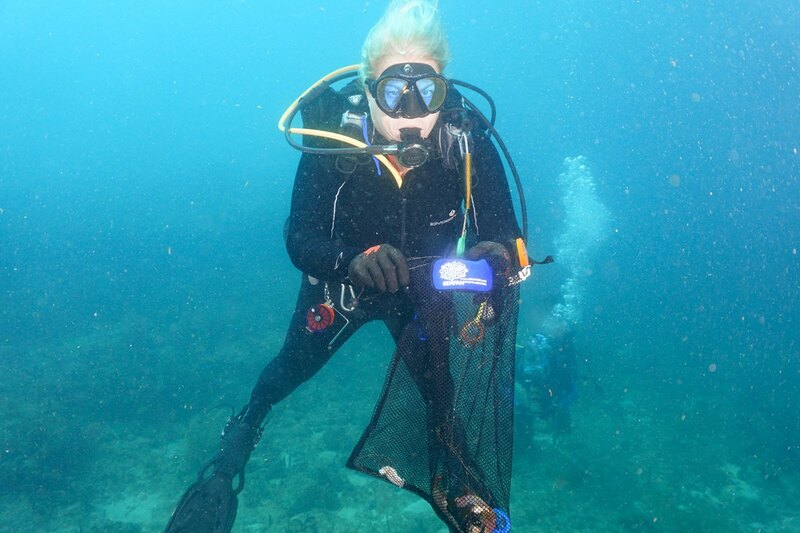 SEFCRI member, Jane Fawcett, holding SEAFAN debris bag. Marine debris cleanup with Force-E and South Florida Diving Headquarters in Pompano Beach. Diver with monofilament fishing line from southeast Florida’s reefs. Maintain a database to store information reported on location, type and abundance of marine debris. Raise awareness, and encourage prevention of, marine debris and its assorted problems through advertisement, educational brochures, and incentives for participation. 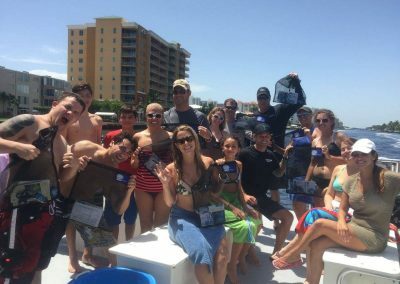 Organize annual reef cleanup events in the four southeast Florida counties, promoting partnerships with local dive shops, dive charter operators, scuba clubs, and local divers. Identify debris “hot spots” (e.g., where debris is concentrated), the reef areas that have been successfully cleaned, and those to be targeted in subsequent cleanups. Provide dive shop and dive charter operators with a “Marine Debris Removal Dive” pre-dive briefing prior to all cleanup events. The information will include proper marine debris removal techniques to ensure the safety of divers and reef organisms.